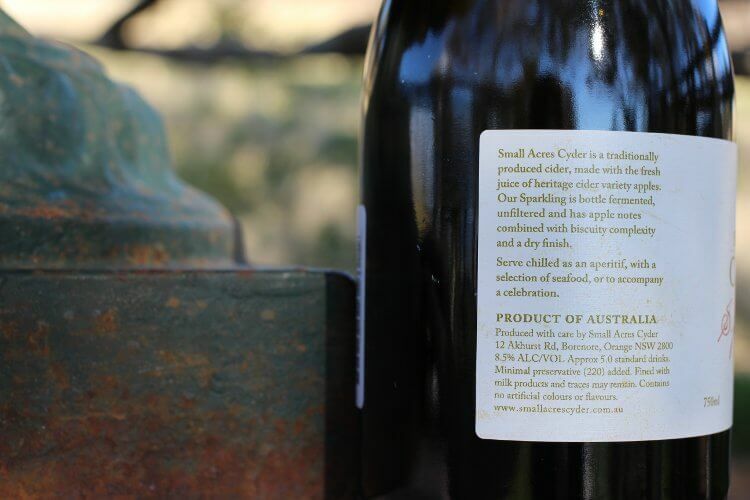 This is the second time I have reviewed Small Acres Cyder Sparkling Traditional Dry I thought I had quite a good “Real Cider Review” typed up after sharing the 2011 vintage cider with some friends. We all had a glass, we all ooo-ed and ahh-ed at the appropriate moments. I tried my best to type as the opinions came forth. The Next day I came back to my draft to add the photos and prepare the piece for you to read, then… Disaster! My laptop went flat and I forgot to hit save once we finished. I only had the most basic notes saved and my memory was fast fading. The solution was to try another bottle. At this stage I bet you have very little sympathy for me but that’s OK, because when I returned to the bottle shop I found that they were all out of the 2011 vintage but they had restocked with the 2012. This made me think, how much can a cider change in a year? In that extra 12 months the cider will have matured. As this is a bottle conditional cider there is still for live micro-flora sealed into a 750ml ecosystem. These could be the yeast eating the last of the sugar, although these would die out within a few weeks of bottling but they produce CO2 with is dissolved into the cider producing the sparkle. Once the yeast dies a process of “autolyses” starts, this is basically the yeast cells imparting a new desirable, soft flavour into the mix. Many of the cider books I have read say bottle condition ciders can peak in there 2nd to 3rd year, making this a great little experiment. Apart from the age the other variable between the two is the apple crop. While I can’t tell you about the yields and conditions that the apple grew in, I can say that according the Australian Bureau of Meteorology the 2010-2011 growing season in Orange started wet and finished drier the 2011-12 season was the opposite. I’ll confess my ignorance and say I don’t know how that information will affect the apples juice yield or flavour. As you pour the bright blonde cider into a champagne flute it reveals just the finest amount of cloudiness. The large bottled conditioned bubbles spray an atomised perfume of musty champagne notes mixed with freshly dug soil. The 2012 showed the same basic structure but unsurprisingly, was slighting fresher. While the ’11 had earthier funk, the ’12 seemed more refined and brighter and ever so slightly sweeter and brighter. I couldn’t tell you if this variation is due to the extra year maturing in the bottle or seasonal variation in the crop of apples juiced to make the ciders. Somewhere in the middle of the 2, the flavour would be on another level. Maybe I should put away a 2012 for another 6 months. Many ciders on the market are marketed as alternatives to beer or worse “the new alcopop” but this is should be put into the same category as sparkling wines; in fact this more than holds its own against a $60 bottle of champagne. This is the first chance I’ve had to taste 2 vintages back to back. While the intention is the same, the 2 vintages do have their differences which make tasting the 2 years more exiting. The seasonality is feature not a floor. 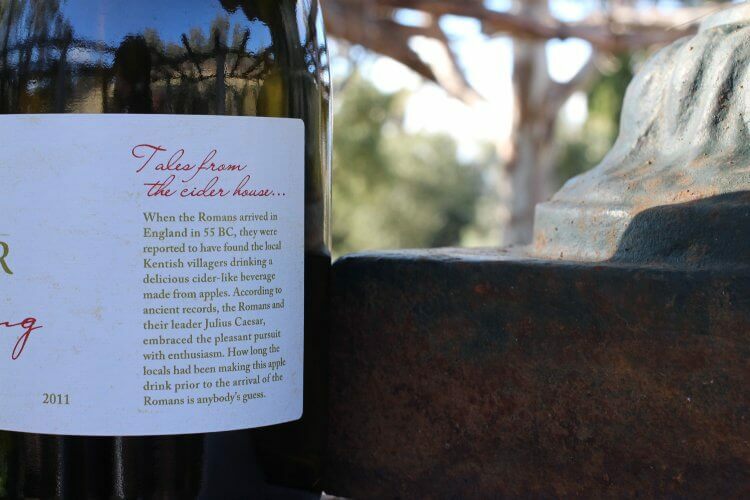 Forget champagne on arrival at your next do, be original, and treat your guest to a flute full of Small Acres Cyder Sparkling Traditional Dry.